ScanGuard Antivirus is a good all-rounder, as far as antivirus programs go. We recommend ScanGuard Antivirus as a simple, solid antivirus program, which has some great extra features, supports a wide breadth of platforms and even comes included with a strong VPN. ScanGuard Antivirus is relatively new in the antivirus industry, but don’t let that put you off – they really know how to keep your devices protected with some rather nice extras – a strong VPN included, wide platform availability and some highly responsive customer service. Find out more in our ScanGuard Antivirus review, below. If you’ve wondered ‘should I download ScanGuard?’ or ‘is ScanGuard safe?’, then read on. Here at SecureThoughts.com, we’ve tested ScanGuard Antivirus for ourselves, and we liked what we saw: you can read our conclusions below. All of the below screenshots below are also from our own testing of the software. Should You Choose ScanGuard Antivirus Software? We really like ScanGuard Antivirus – there are some pretty neat features available, including that strongly encrypted VPN, a straightforward antivirus dashboard and perhaps most importantly – top of the line, responsive and 24/7 customer support available. With that fantastic first term discount, there’s a lot going for ScanGuard Antivirus – despite what some of those more skeptical ScanGuard reviews may say. You get what you see at ScanGuard, which we appreciate. 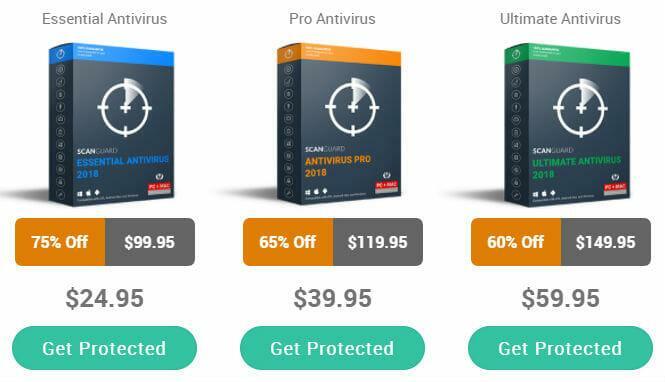 You can pay a $99 flat fee for Antivirus Pro for one year, with a generous initial offer of 50% off – you’d be paying $49 for the first year, and if you’re lucky, you might also be offered a further discount to $39. If that weren’t enough, ScanGuard Antivirus will also throw in a free welcome gift of an Enhanced Firewall and a System Boost, which would usually set you back $38. That’s a pretty sweet deal. Remember that these programs renew automatically after your agreed term has passed. But, this is offset by a 30-day money-back guarantee if you change your mind, which is good considering there’s no free trial before purchase. These are perhaps the most important aspect of staying safe online, especially as the threat of online phishing, malicious viruses and other cyber-attacks are much more sophisticated than they used to be. ScanGuard Antivirus comes with two types of scans to keep you protected – a quick one, to check the everyday places you need to keep an eye on – your desktop, downloads, browsers…etc. – and then a full, in-depth scan to check every nook and cranny of your device. If something is detected – adware, spyware, malware…etc. – it will be quarantined instantly, to prevent it from causing any further harm. ScanGuard’s tools will keep you protected from both viruses and malware, but they have added extras that, along with the rest of the package, will keep your computer running smoothly. The File Manager will clear up your duplicate files, while ScanGuard will also try to optimize your output for speed and performance, managing your settings to keep your device running nicely. This includes working through your old internet history or unwanted caching, all the while keeping your stored information unharmed. There are also future plans to include parental controls with the antivirus software, which is always useful for parents wanting to monitor their children’s’ online activity. Here’s the thing: the current firewall offered as standard by ScanGuard does the job – but nothing more than that. In fact, compared to Windows Defender, there’s nothing that much more to offer. However, all is not lost – ScanGuard’s site states that they soon hope to bring out a new, improved two-way firewall, which at the very least suggests that they’ve listened to their customers’ feedback and are seriously looking to improve their products, which is always good thing to see in any industry. It is indeed – ScanGuard Antivirus’ setup is very straightforward, taking a couple of minutes to do. You first need to make a username and password to login with, and then you can go straight to the site’s payments page. Choose the product you’d like to buy, and you’ll then go to the ‘downloads’ page. Click on the download button and watch the installation begin automatically. Follow the setup prompts, use the recommended settings, and wait for the install to finish. You also have the option to set the times that your device is scanned, as well as some further scanning options. ScanGuard Antivirus is available on Windows, Mac, and iOS, Android, Blackberry, Chrome OS, and Amazon Fire. This is a pretty impressive array of platform options compared to other antivirus software on the market. Hands down, the best element of ScanGuard Antivirus is the cross device capability, You can expect the exact same user experience on every device you use it on, and it’s easy to use, and doesn’t interfere with your device experience. If you’re stuck, the helpful video tutorials will help you out with how to use the software. The well-displayed dashboard shows you if there are any threats on our device, quarantined items ready for you to delete them, and the option to start either the quick scan or full scan. There are the extra features available there too – the System Boost and Disk Cleaner, which can be activated by clicking on each option located in the left-side toolbar. As we mentioned above, ScanGuard Antivirus has excellent customer service – a rarity nowadays – we’ve all seen examples of fantastic customer service pre-purchase, which often disappears immediately afterwards. Yet, ScanGuard Antivirus offer 24/7 customer support, via live chat, phone and email. There’s also a solid FAQ with answers to all of the commonly asked questions you may have yourself, as well as loads of helpful articles, tutorials and troubleshooting issues, should they arise.